"This short and charming story of a frog jumping away from such dangers as snakes and turtles pleases--rom its bumpy, springy accompanying music to the friendly baritone of its narrator. Frog croaks, splashing water, and a "boing!" as the frog jumps are some of the entertaining sounds that accompany the text. The sound of a page turning signals little listeners to turn the page of the accompanying large-format paperback. The timing of the page turns will be right for 3-5-year-olds but may be a bit fast for the littlest listeners. That's the only quibble about this nicely packaged production." "A frog tries to catch a fly, but finds himself on the other end of the food chain in this simple cumulative tale by Robert Kalan (Greenwillow, 1995). As each new danger appears, the frog is left with one option: jump, frog, jump! The frog's final escape, however, requires the help of a boy. 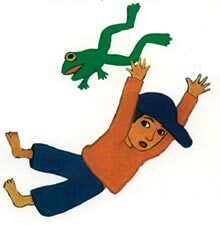 Young children will enjoy the suspense as the frog struggles to survive, and will join in with the male narrator in the repetitive text. A few simple sound effects are used, as well as occasional light background music. Sound quality is excellent. Page turn signals are offered on one side of the tape. This is a book that pre-schoolers, especially, will embrace for its simple plot and step-by-step action."